Have you ever heard “When there is onion there is hope”? Who said that? But in my kitchen it is true. The gardening season has begun. 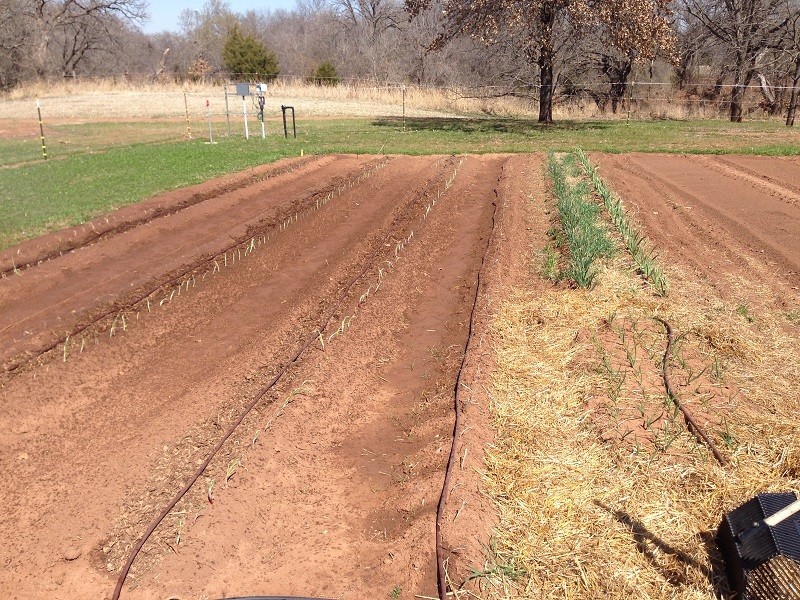 We are transplanting onion sets, leeks and planting potatoes. 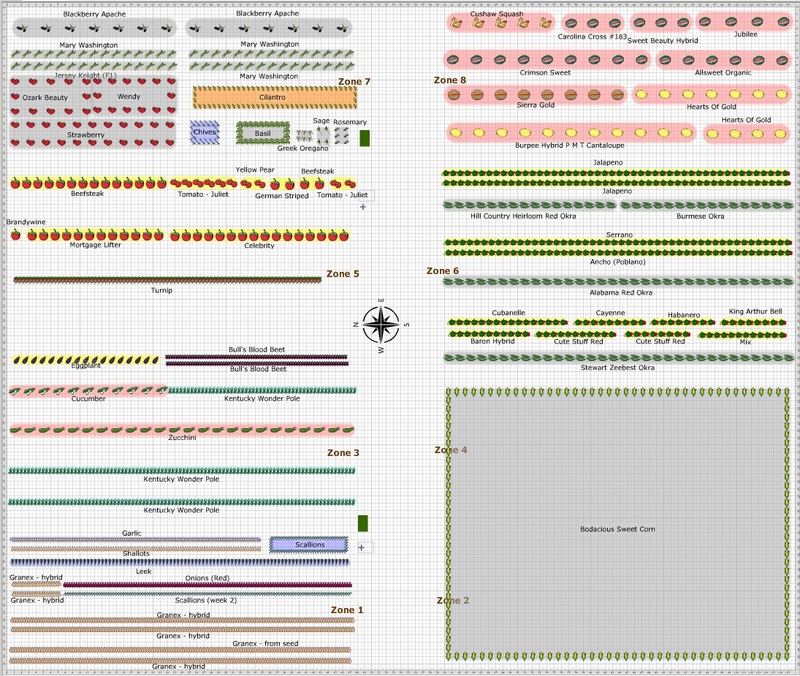 Starting a plan for the 2014 garden Variety in the garden is important. 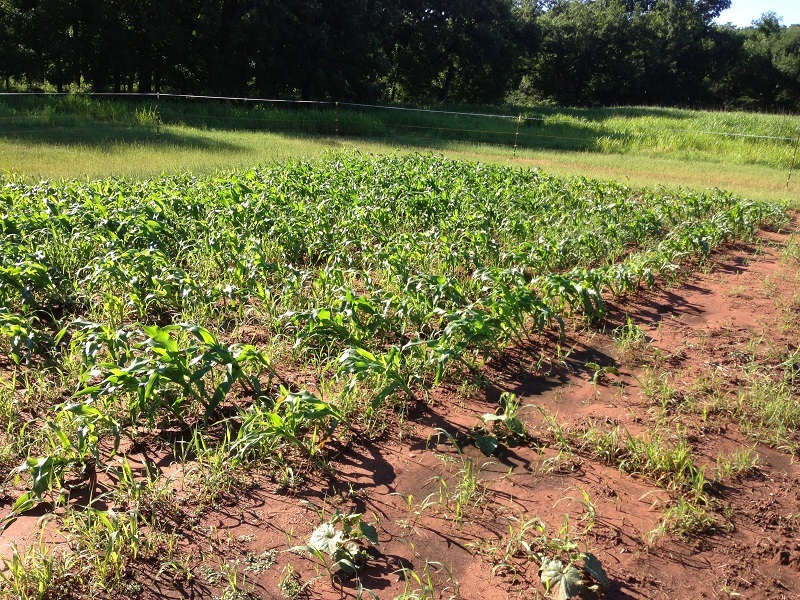 Crop rotation is made easy with planning software. 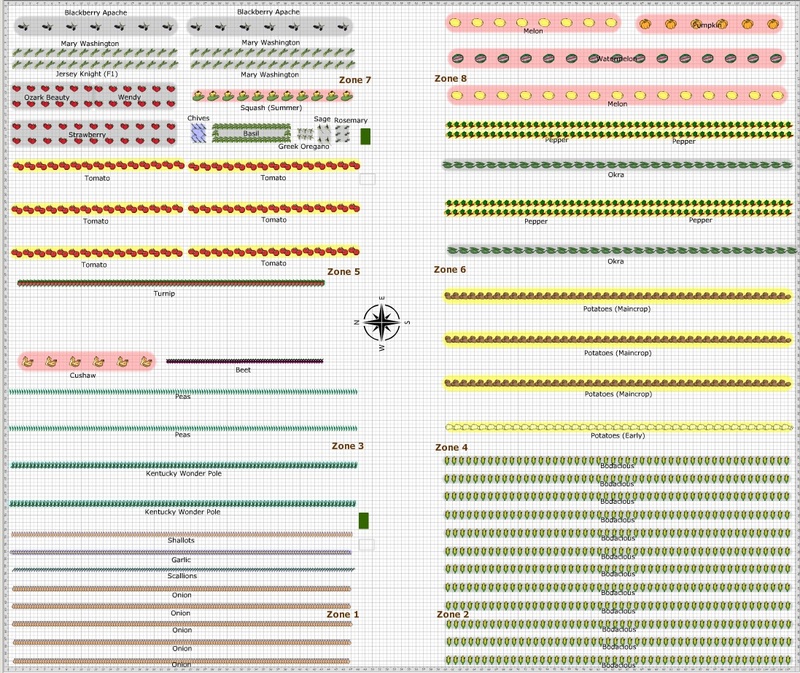 It is simple to layout next year’s garden. Looking back at old notes and gardens, variety is not my strong suit. I seem to plant the same varieties year after year. This year will be different. Next year will have 1/3 new varieties. Any failed variety gets booted (Brandywine tomato, Gonzalez cabbage, Tomatillo Roma Verde). I will save seed from our best crops and use some swapped seeds from my family. Row spacing is changing some too. To cultivate between rows, I’d like to buy a cultivator/hiller for the tractor. It uses adjustable tines, disk and blades. We can cultivate our 5 foot row spaces and then also rows space 2 1/2 feet too. It will hill corn in narrow rows and potatoes in wide rows. 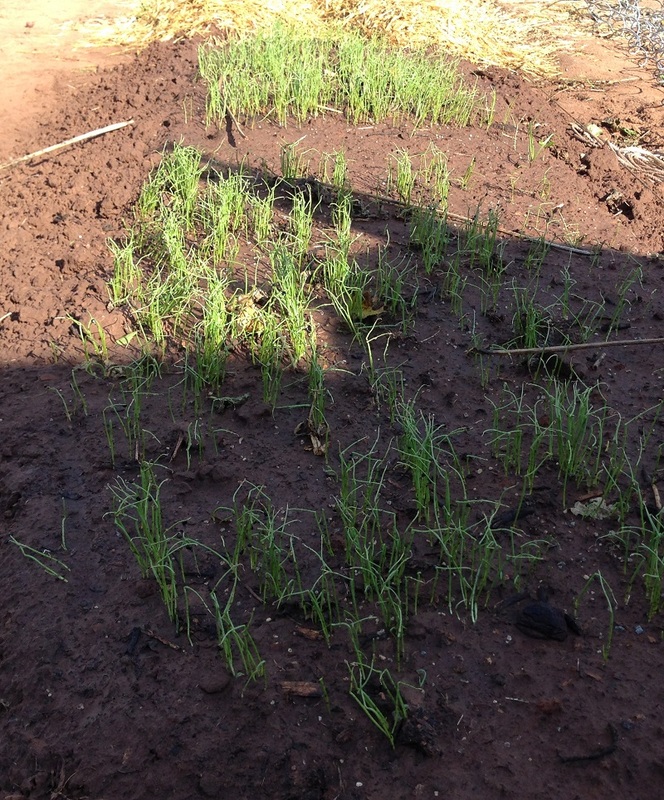 Still need to buy and plant onion, shallot and garlic to be planted in the next few months before winter. I wonder if anything of value is accomplished without adversity? Have all the really easy jobs been taken? This late spring’s planting season weather has been strange. Frosts in May and the 90 degrees two weeks later. Tomatoes got a very late start with the summer heat approaching. Three of 30 early planted tomatoes have survived. The volunteers don’t mind at all. They come just for the joy of gardening. There is nothing strange about the urge to see things grow and get soil in your hands. The kind people at Exencial Wealth Advisers have adopted garden! They come once per week to volunteer. 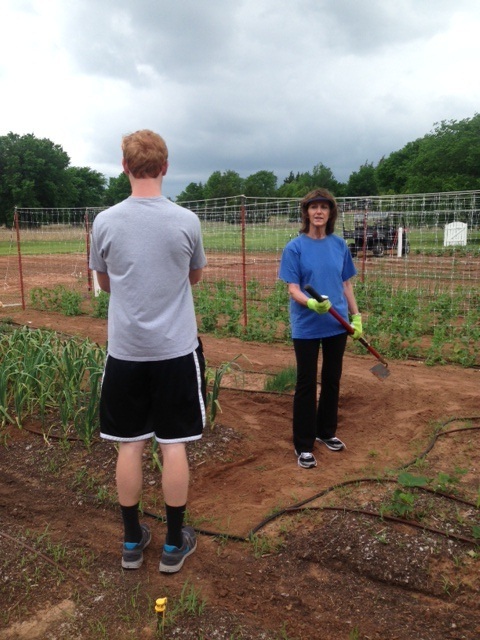 In the last two weeks they helped finish planting (90 tomatoes, 100 pepper plants, tomatillos, okra, squash and almost 500 feet of corn!) and mulched. Weeding and cultivating are the chores they took on this week. The picture above shows D’Anna Boone and Ryan Fuller. D’Anna used her hoe to cultivate potatoes, hilling soil around the plants and clearing weeds. Ryan weeded tomatoes, and I think (in the picture) is noticing the low hanging storm clouds moving our way. Within 15 minutes of that picture, we we swamped in a downpour. We hastily loaded up the buggies and sped for the barn. We were all soaked. The unpredictable weather continues and our enthusiasm remains strong. A small sign of things to come are ripe strawberries! They are sparse and won’t make a crop, but next year they will. The sweet peas in the background will be the first real crop. The trellising has worked perfectly as almost all of the plants have attached to it and are blooming! I wonder if they need side dressing of fertilizer? The peas, onions and potatoes seemed to have disregarded the frosty weather and look pretty good. Just visible in the foreground are asparagus fronds. The Martha Washington is emerging for the first time. Tomatoes are planted, let the gardening season begin! Planting onions and potatoes is not as satisfying as planting tomatoes. This planting starts the gardening season for me. Maybe this is because my earlier gardens were small and very few varieties could be put in, so tomatoes, my favorite veggie to grow, was usually first. This year the first tomatoes in are Celebrity and Big Beef seedlings which were started early. 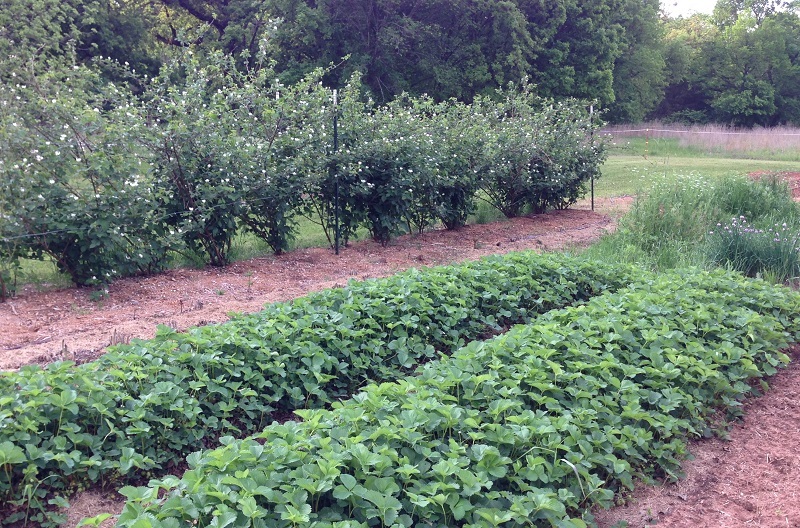 Planting early is risky but these plants may well produce the first fruits of the season. Does everyone want to say: “I am already getting tomatoes from my garden!”? I need to shake off this boast and replace it with: “Man we are harvesting lots of tomatoes!” If is true then our food bank clients will be very happy. The seedlings are long and lanky, perfect for planting ‘on their side’. 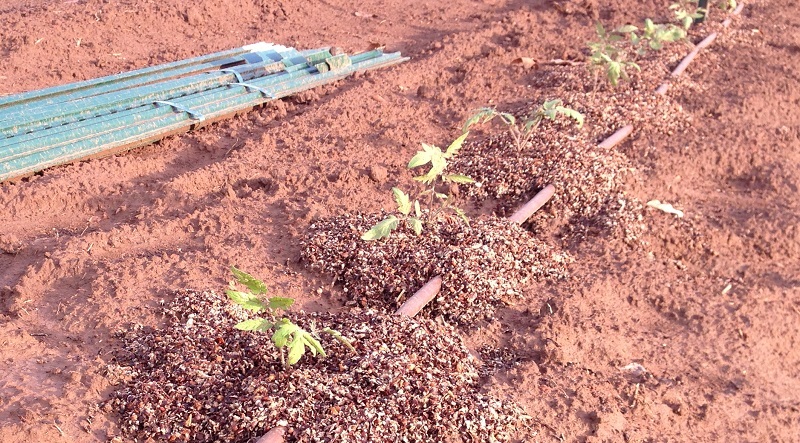 Long seedlings are laid in a trench, about 6 inches deep, so that the stem is mostly underground. The tip of the plant is gently bent to point up and out of the trench. Only a few leaves at the tip of the plant peek out above ground. In about two weeks the entire buried stem becomes covered with roots establishing a great root base for the plant. Half the roots will come from the root ball and half from the stem. 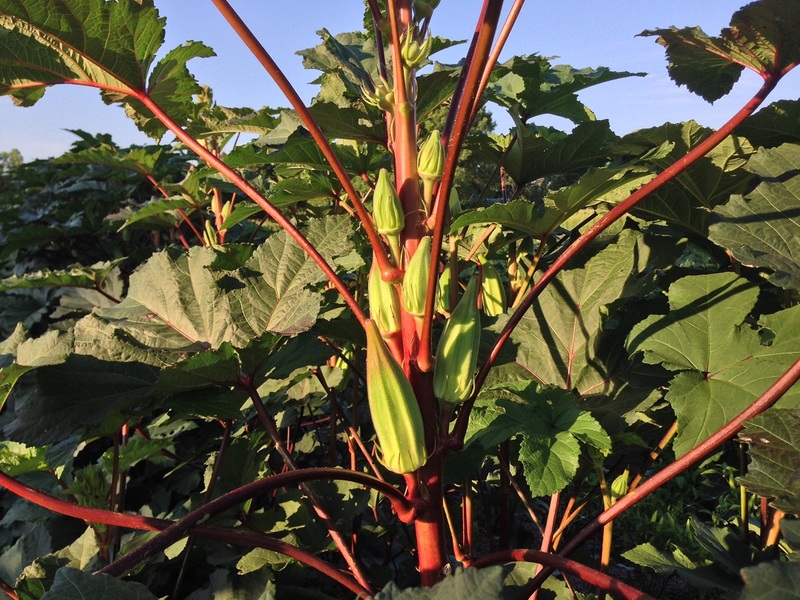 We plant the stems to align with our drip irrigation lines so the roots are nearest water and cultivation near the row will not disturb major roots. The soil 1 foot below ground was very compact. It was difficult to drive a stake or to spade up. To encourage roots to grow down, the ground was broken with a 2 foot breaking plow. Each bed was plowed twice with this breaking plow. It is also called a sub-soiler. Tomato roots can be 5 feet long. To get this long they will need to grow down. It is risky to plant tomatoes in March in Oklahoma. Historical last frost is March 4th. But this is long history. A shorter view of ‘history’ is our heat wave. The last few summers have been ‘historically’ hot. Last year the last frost was March 7th. The heat has reduced the number of days tomatoes set fruit. So these early risky tomatoes hedge against another hot year. These tomatoes will have had a couple more weeks to bloom than later plantings (early April). The seasonal changes in Oklahoma make it a great place to live. If you like to see this sort of thing. In an Oklahoma spring, pears and plums bloom first, large flocks of Cedar Waxwings fly together whistling and take water at my pond. Daffodils and chickweed are in full bloom too. Wild geese pair up. But despite all these signs and having peas emerging by the hundreds, and 1/2 the garden already in the ground, planting the tomatoes marks the beginning of the garden season for me. You have to look very closely. It is not obvious. The garden is greening! Plums and Pears are blooming! Spring is in two days, snow is in the 4 day forecast, yet plants are emerging and greening up the garden. If you look closely above, the few herbs and garlic look strong. The onions are beginning to set roots. I expect the peas to come up any minute! 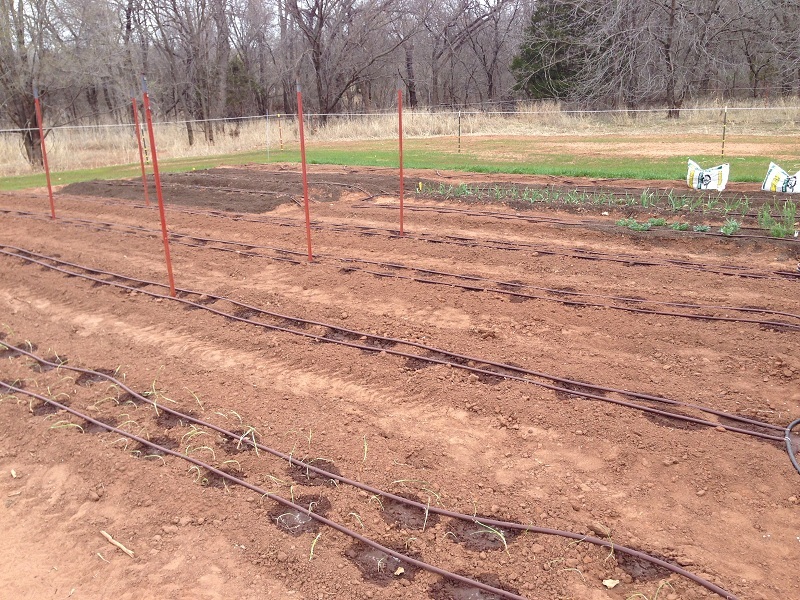 Notice the drip lines are installed, and this 1/4 of the garden is planted. Adrian did the heavy lifting and dug 100 feet of 18 inch deep trench to plant asparagus. We filled 1/3 of the trenches with chicken litter compost and planted Mary Washington and Jersey Knight. The herbs provide instant green. Planted Rosemary, Oregano and Sage. The Chives from seed should go in tomorrow. The following show a 4 row section of cabbage onion, carrots and potatoes. It is quite a mix of veggies side by side. Crop rotation in the garden is going to be difficult. We have so many peppers, tomato, and potato: these make up over 1/4 of the garden. Each is in the same family and rows should not have any of these for 3-4 years. Will have to be clever with rotation. The grass we planted in October is doing well. It is the greenest success so far. The deer keep it mowed outside the fence and inside almost needs mowing now. The grass mix is annual rye, perennial rye and white clover. The clover sprouted last winter but is scant. Still planning on getting in some early tomatoes next week (if no snow or freeze in 7 day forecast).